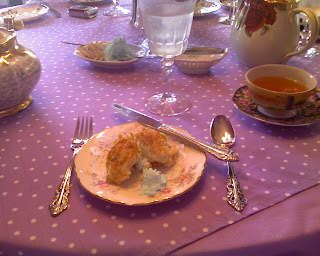 I am out with the girls having tea. 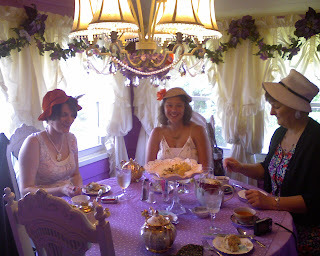 I'm wearing a cute hat! 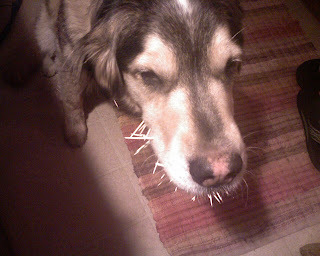 a couple weeks ago mutt came to the door with a face-full of quills. i was astounded. this is the dog that is afraid of birds and rabbits up close....i can't imagine what possessed him to bite a porcupine. 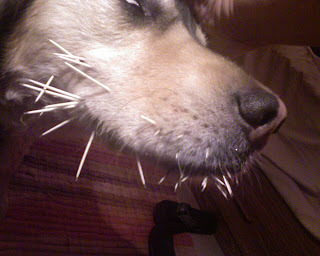 i spent several hours pulling the big quills out of his face, only to discover when i could finally open his mouth that it was full of tiny and broken off quills. bazillions of 'em. so off to the animal emergency hospital we go....he never EVER needs medical attention when his vet is open....to have them taken out under anesthesia. 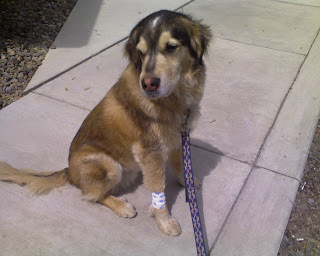 an hour and several hundred dollars later they delivered him back to me with a bandage where his IV had been, and prescriptions for antibiotics and pain medication. 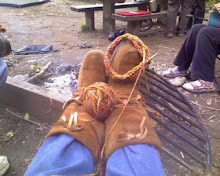 they told me that 2 quills remained, and would have to work themselves out. i was a little annoyed that for all that money, they coudn't get them all. i am even more annoyed 2 weeks later when i have pulled about 18 of them out of different parts of his nose and face, even near his eye, as they work forward from the inside out. he has been pawing at his face today, so i'm not sure we're down with them yet. the pics above are him pre hospital, and immediately post-op with his little bandage on his leg. 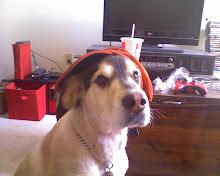 what i didn't get a picture of was when he lifted his leg to pee, and toppled over like a drunken sailor. i had to laugh, rotten mother that i am!